HP DesignJet T1700 printers, the next-generation 111.7cm (44 inch) solution for CAD and geographic information system (GIS) workgroups, produce highly accurate documents and maps with powerful processing and a new level of security. New added features on the HP DesignJet T1700 make it the most secure large format workgroup printer available today. The improved security is designed to help enterprises print CAD and GIS applications while protecting printers and data from unauthorised or malicious access in infrastructure construction, urban planning as well as utilities industries such as oil, water, gas and electricity. Features include a new self-encrypting hard drive on the printer, which ensures it is only readable by the printer itself, even if removed from the device. For additional device security, HP Secure Boot ensures BIOS protection, and Whitelisting only allows approved firmware to be installed and run on the device. GIS files are constantly growing in size with the increase in their complexity and data. To smoothly process this information and improve the printing experience of GIS practitioners, the HP DesignJet T1700 printer offers a new, powerful processing architecture using a 500 GB hard disk. As the first workgroup large-format printer to embed the Adobe PDF Print Engine (4), it can more efficiently handle very heavy files. As a result, PCs can be freed in virtually no time to continue working. 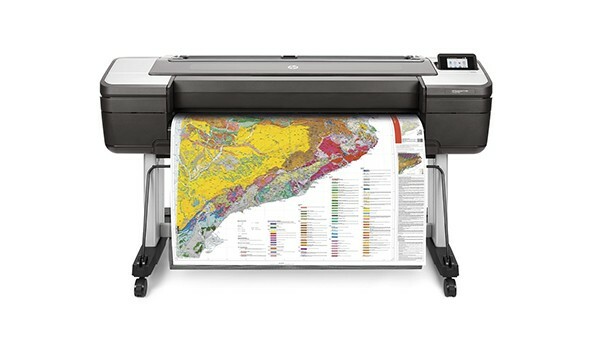 The HP DesignJet T1700 also brings improved colour quality and precision for more accurate maps and renderings, enabling GIS workgroups to make better decisions. A new set of six HP Bright Office Inks with tuned colour profiles and a High Density Print head deliver bold colour and accurate image quality, in addition to more precise colours, including grey and soft tones.